When you’re caring for a pet fish, you pretty much only have one major job: feed it. So you might as well make sure you’re feeding it right! Different fish require different types of food, so make sure your fish food is good quality and also a good choice for the fish you actually have. Do you have a freshwater or saltwater fish? Does your fish need special tropical fish food? Do your research on your fish and then check out our list of Pro Pet Supplies Fish Food choices. From flakes to pellets to freeze-dried worms, ingredients definitely played a part in our ranking considerations. Many types of options were included for the variety of fish out there – the form of the food, food with particular ingredients, tropical, freshwater, or marine food, food for herbivorous fish versus carnivorous fish and so on. The variety offered in various brands also affected their ratings. Pro Pet Supplies offers several different brands of fish food each with their own variety of options. The Wardley Brand wins the top spot on the Pro Pet Supplies fish food list because of the variety of products they offer to suit the needs of whatever fish you have. They carry a wide range of flake and pellet food, and depending on the food, it’ll cost you from $3 to $18. Here’s a list of their fish food varieties: Advanced Nutrition Goldfish Flakes, Goldfish Flakes, Goldfish Floating Pellets, Goldfish Slow-Sinking Crumbles, Algae Discs, Shrimp Pellets, Betta Food, Total Tropical Gourmet Flake Blend, Tropical Flakes, Weekend Feeders, and Pond Stix. Follow the links to take a closer look at some of Wardley’s fish food options through Pro Pet Supplies. 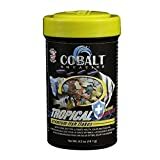 Cobalt Brand Fish Food takes second with its wide selection of fish food flakes for any species of fish you could have. Compared to Wardley, Cobalt’s prices are about the same (from $3 to $18 depending on the type of food). Pro Pet Supplies sells several different sizes of each flake variety as well. Here’s their large expanse of flake fish food options: Spirulina Flakes, Mysis Spirulina Flakes, Discus Hans Flakes, Cichlid Flakes, Tropical Flakes, Tropical Color Fish Flakes, Marine Omni Flakes, Shrimp Pellets, Goldfish Color Flakes, and Betta Minis Color-Enhancing Fish Food. Follow the links to take a closer look at some of Cobalt’s fish food options through Pro Pet Supplies. Freeze-dried garlic slices. Pair with Dr. Tim's Bene-FISH-al fish food! Mix in with Bene-FISH-al food. Do NOT grind directly over aquarium. A more innovative feeding option in Pro Pet Supplies’ fish food inventory comes from a brand called Natural Bene-FISH-al Fish Food by Dr. Tim’s Aquatics. The brand kind of has this DIY food set-up where you mix and freeze the food plus the extras you chose in their little $11, 90-cube tray to feed your fish. If you want a more involved fish-feeding experience, this food is for you. Natural Bene-FISH-al prides itself on its rich nutrient-filled ingredients and lack of fillers, wheat, gluten, GMOs, artificial colors, flavors, and preservatives. You start with one of their base fish food mixes – freshwater or marine for around $30. From there you can add in any of their extras to supplement the main food bases. There’s an extras variety pack for about $81 that includes all the extras – the foods are garlic, peas, seaweed, mealworms, shrimp, and gammarus. Too much for you? No problem, they also sell the extras grinders individually – like the seaweed grinder for about $8. High Quality Protein - Our main source of protein is whole Anchovies and whole shrimp. Resulting in high protein levels, increased feeding response and palatability. The Elive Brand products Pro Pet Supplies offers are mostly color-enhancing fish flakes, pellets, and granules. They too have a wide variety of flake types for the needs of different types of fish. Prices range from $3 to $9. Here are the fish foods you can choose from: Tropical Color Flakes, Tropical Color Granules, Marine Color Pellets, Marine Color Granules, Herbivore Granules, Cichlid Color Pellets, Cichlid Color Granules, Goldfish Color Granules, Goldfish Color Flakes, Betta Color Granules, and Algae Wafers. Follow the links to take a closer look at some of Elive’s fish food options through Pro Pet Supplies. Pro Pet Supplies offers various types of freeze-dried fish food to maximize the freshness and nutrients available for your fish without having to use live food. Their freeze-dried options include Antarctic krill, bloodworms, plankton, brine shrimp, and tubifex worms, all for about $5 to $6. Follow the links to take a closer look at some of the freeze-dried fish food options through Pro Pet Supplies. Some of the other brands have a betta fish food option in their flake and pellet inventories, but the Zoo Med Brand also offers accessories and time-release food for your pretty bettas. The fish food itself is only about $2 to $5 which is incredibly convenient. The main betta food they offer is the Micro Floating Betta Pellet Food. If you want to spoil your betta for swimming extra hard one day, consider the Betta Dial-A-Treat. It includes three little sections for mysis, daphnia, and bloodworms – some of a betta’s favorite treats. Going to be gone a few days and worried about your betta since you can’t take it with you? No problem – Zoo Med has 7-Day Time-Release Feeding Blocks to take care of your little swimmer for up to a week while you’re on vacation. If you want to take that a step further, for around $24 Zoo Med has the BettaMatic – an automatic daily feeder for your fish. With it, you can feed your betta while you’re away, or have it set up to automatically dispense daily so you don’t have to worry about forgetting to feed your fish. You can schedule it for a certain time each day. It mounts to the side of a tank and comes with a rail kit for round bowls or other abnormal tanks that the mounting doesn’t work on. 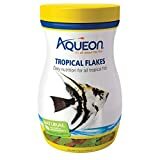 Pro Pet Supplies offers two Aqueon Brand fish food products: Aqueon Tropical Flakes for about $8 to $10, and Aqueon Shrimp Pellets for about $4 to $10. The flakes are color-enhancing, nutritious, and formulated in a way that less of it goes to waste. The shrimp pellets are the sinking type, and work as good fish food for any kind of fish. Different types of fish need different types of food so they can just keep swimming as happy as can be (for example, betta fish have heir own specific type of food). Will you be using pellets or flakes? Which is the right choice for your fish based on size and diet? Do your fish have a preference? Do you want to give your fish a treat of a freeze-dried worm or shrimp every once in a while? Do you want to dig up a few earthworms in your garden and plop them in the tank so your fish can snack? All of these are viable fish feeding options. Flakes – Common, cheap, and generally well-loved by most aquarium fish, flakes are often the go-to for fish food. They’re best for fish who like to hang out in the middle or at the surface of your tank – they typically dissolve and lose nutrients after sitting on the bottom too long, so they’re not ideal for your bottom-dwellers. Crisps – Crisps are basically flakes, but denser and thicker. They float longer, dissolve slower, keep nutrients longer, feed cleaner, and leave less waste. They’re also ideal for top and mid-feeding fish, but they cost a little more than flakes do. Crisps can be too big for some of the smaller fish, but that’s an easy fix if you just crush the crisps with your fingers before dropping them in the tank. Pellets – There are floating pellets, slow-sinking pellets, and fast-sinking pellets. Just like it sounds, floating pellets (the most common pellet) float on the surface for a long time – ideal for top-feeders like betta. Slow-sinking pellets will fall slowly through the water in your tank so mid-feeding fish have enough time to get their meal without going near the surface. Fast-sinking pellets immediately drop to the bottom and have tons of nutrients for your bottom-dwelling fish. Wafers – Wafers (sometimes called tablets) are a larger type of fish food. They’ll sink to the bottom of the tank quickly and soften slowly. Wafers are meant to be broken up and nibbled on by your bottom-dwelling fish. Freeze-Dried – Freeze-dried fish food is what it sounds like – food to feed your fish that was once alive but is now frozen. Most dry foods (flakes, pellets, others listed above) are a mix of different ingredients, but freeze-dried food is a whole, intact, once-alive food. Common frozen fish foods include bloodworms, brine shrimp, and krill. Freeze-dried foods have a long shelf-life. Live Food – Live fish food is something you can buy or grow yourself. Some fish (wild-caught) may only recognize live food as a food it can eat, making live food a necessity. Other than that, live fish food has more of a hobby fish feeding use. Bloodworms, earthworms, water fleas, mosquito larvae, and brine shrimp are all live food possibilities. The major problem with live food is the possibility of introducing disease into your fish tank. Enjoy watching your fish during feeding time!